GeoN Insitu tests require that a filter tip and an extension pipe is installed in the ground. Testing is performed by lowering a ”GeoN -probe” down through the pipe. The probe connects to the filter tip, to the aquifer, by means of a leak proof quick connect, a needle connection, and the test can begin. For GeoN -sampling in open systems, no filter tips are required. The sampler includes a needle connection that is pneumatically activated when the sampler has been lowered down to sampling depth. GeoN GT is based on a technology that has been used worldwide since the late seventies, in thousands of installations. GeoN GT brings the insitu conditions right into the laboratory or into the computer. Due to its unique features, GeoN GT offers the highest accuracy possible, it eliminates a number of error sources and it is easily handled. It is strictly best available technology. Indication for certain circulation pumps regarding AC magnetic fields and direction of rotation. There are mainly two applications of the VJK indicators, i) for permanent installation close to/at the AC source and ii) as a ”Key-Ring” product. 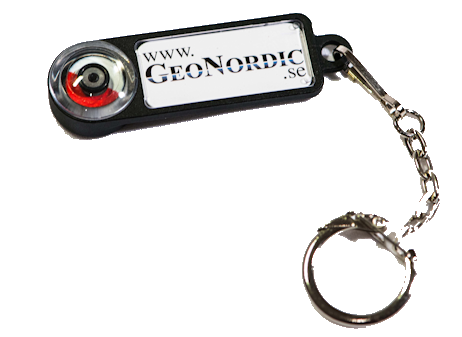 The ”VJK Key-Ring Indicator”, supplied with the client logotype, is a well known, much appreciated and unique product, usually used as a ”give-away”..